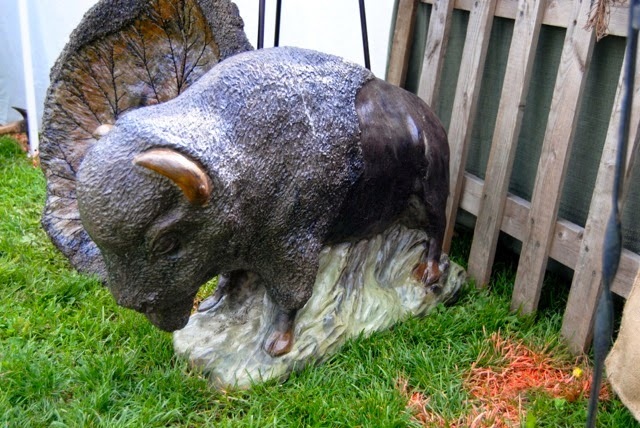 The third annual Buffalo-style Garden Art Sale is happening this weekend - Sunday, June 29, 10 a.m. to 5 p.m. at the Delware Park Lodge, 84 Parkside Avenue, Buffalo. 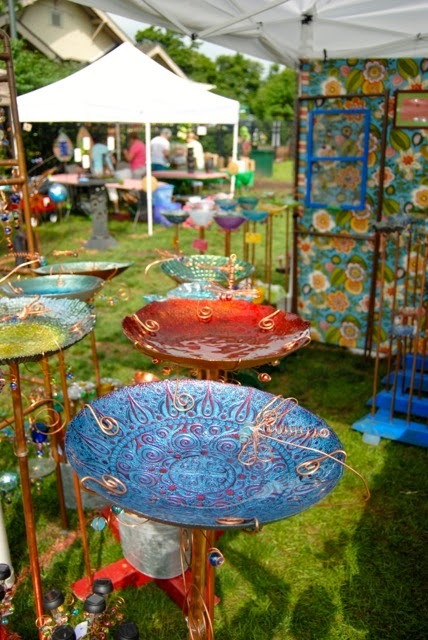 We have 39 or 40 vendors of arts and crafts related to the garden. 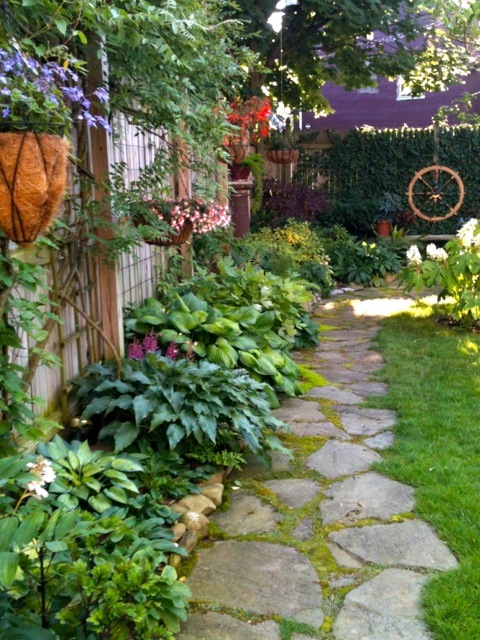 To participate, you have to be a creator, or vendor of items inspired by the garden or nature. 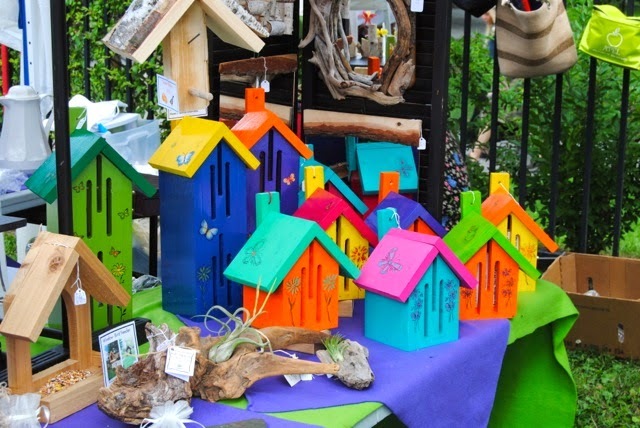 Most vendors are artists that create art for the garden - sculptures, furniture, obelisks, birdbaths, wind chimes, birdhouses, glass work and so on. 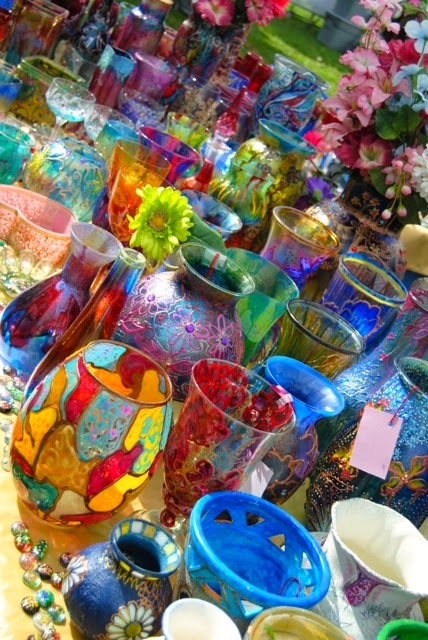 But materials from which items are made are wood, steel, glass, stone, copper and more. I am one of the many organizers of the event. When I say many, there really are just six or seven of us. 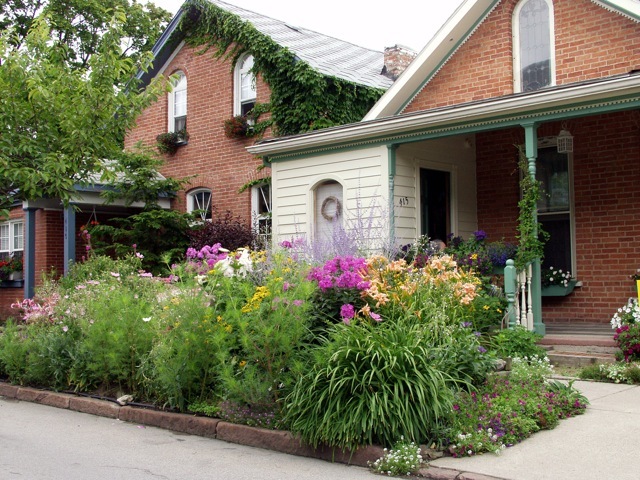 We have the full support of Buffalo's National Garden Festival (which really means we have the support of Visit Buffalo Niagara, our visitors bureau), as well as great planning support, and the space to use at no charge, from the Buffalo Olmsted Parks Conservancy. 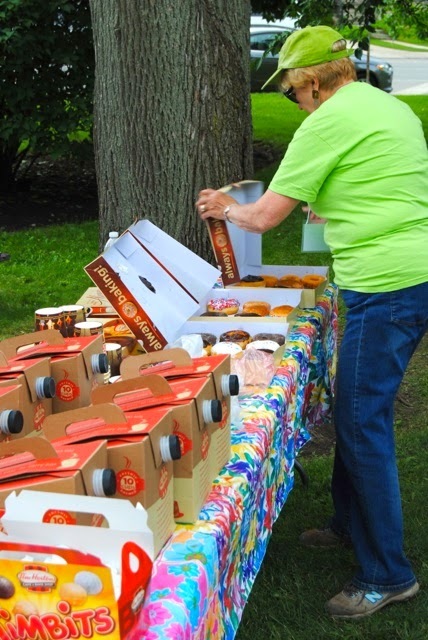 vendors, or stealing donuts. Not sure which. 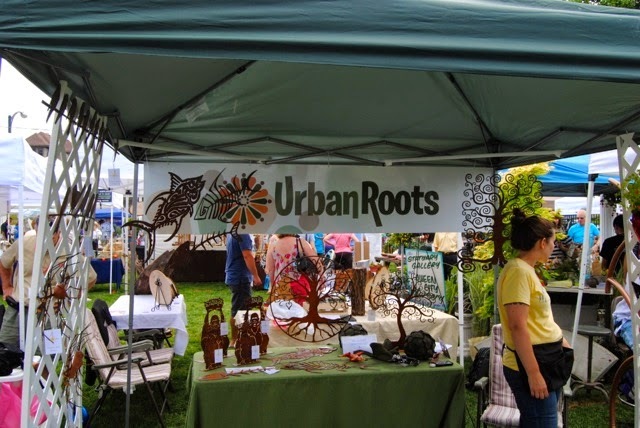 The first year, in a panic that we would not have enough vendors, I had a stall selling handmade hypertufa planters, over sized copper leaves, and wine bottle torch kits. I won't have a booth this year, but my daughter will. 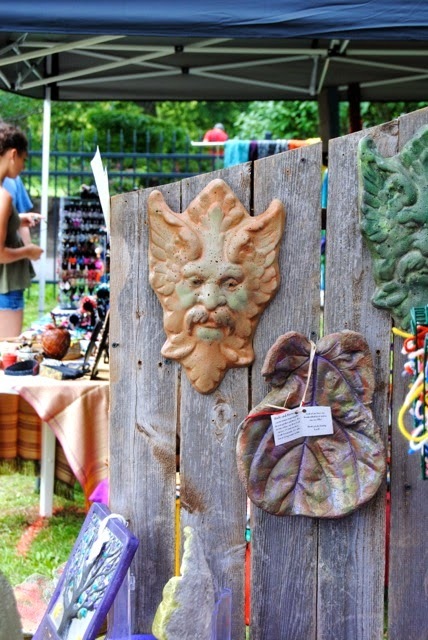 She'll be selling her nature-inspired glass bead jewelry – and the planters, torch kits and copper leaves left over from the last sale. 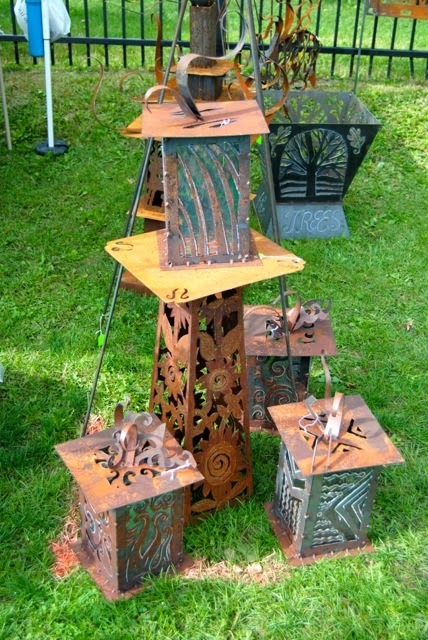 Mark Witol metal garden art. 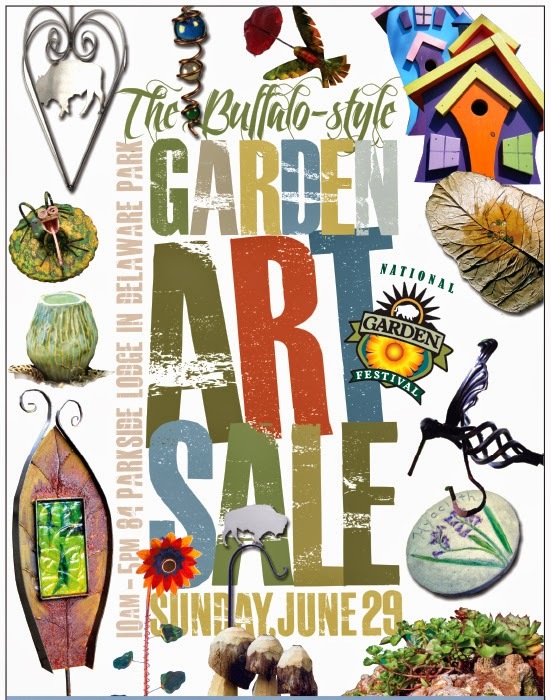 I'll be somewhere selling the Garden Walk Buffalo bookazines, as well as helping visitors and vendors. 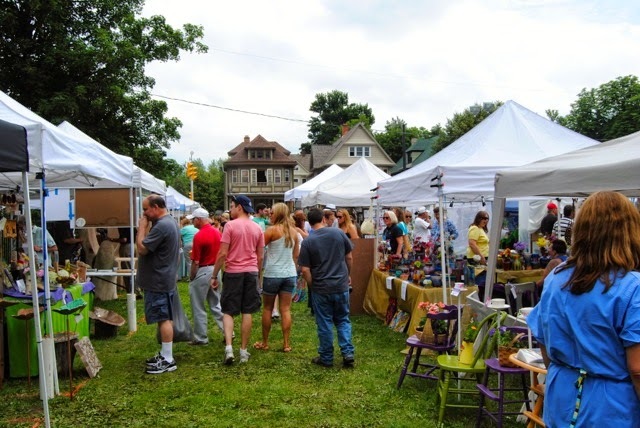 In addition to the vendors, we'll have a "Plant Society Avenue." 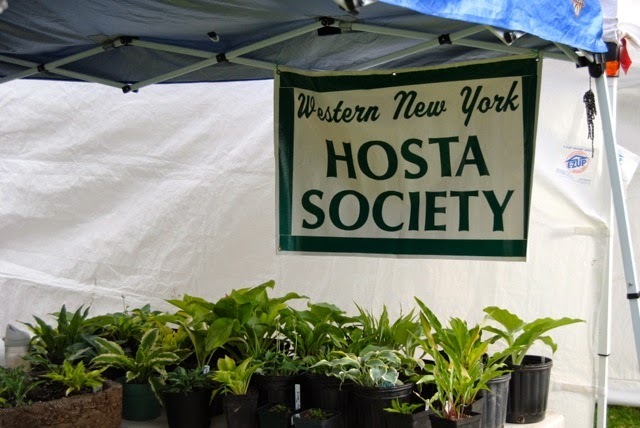 Area plant societies and the local Master Gardeners will all have tables and be answering questions for visitors, soliciting members and distributing information. 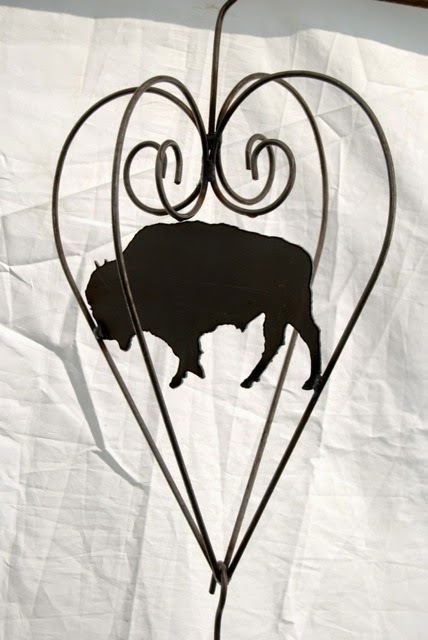 Each plant society/group will also make a donation to a raffle basket which we'll raffle off. 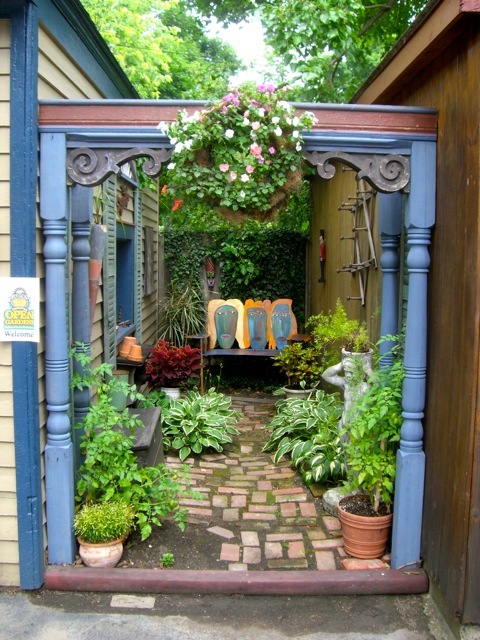 And if all that is not enough - the sale is also taking place during, and in the footprint of, the Parkside Garden Tour. 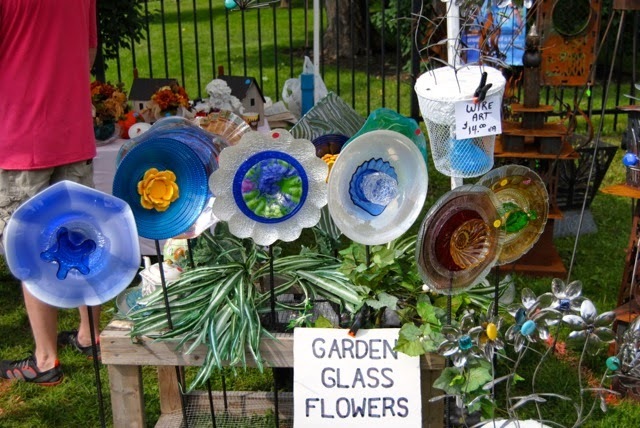 Dozens and dozens of gardens to visit right across the street from the Garden Art Sale. 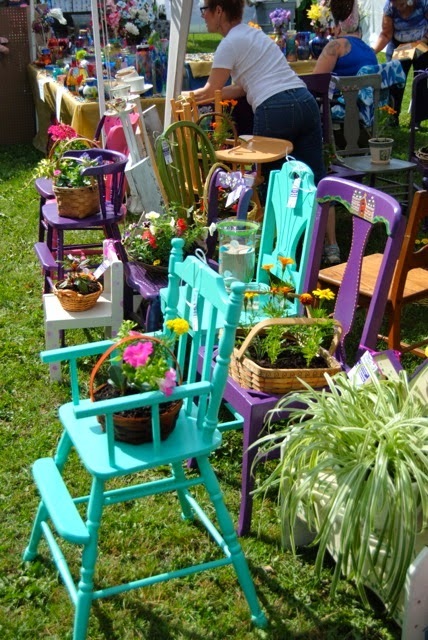 The vendors are coming to us from farther afield this year. One from Florida, one from Ohio, and a quite a few from the Rochester area. We're told we won't grow much beyond this until we offer the sale for two days, instead of just the one-day sale. Most vendors that travel find it too much work to travel, seet up, and tear down for a one-day event. We do try to make it easy for vendors though. It's only $50 to have a table, along with a non-refundable $10 application fee. After that, we ask fro 10% of sales. So if a vendor sells little or nothing, they're not out big bucks. And if they have a great sales day, we benefit too. We also have volunteers that help them set up and tear down. On top of that, we provide two lunches per booth, bottled water and coffee and donuts in the morning. We also provide posters and postcards for each vendor to send out to friends and fans with their vendor packets. 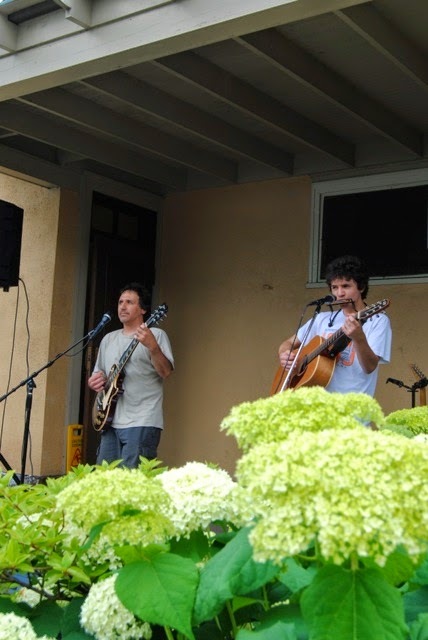 It doesn't sound like much but it's greatly appreciated by the vendors (we're told – or overheard!). 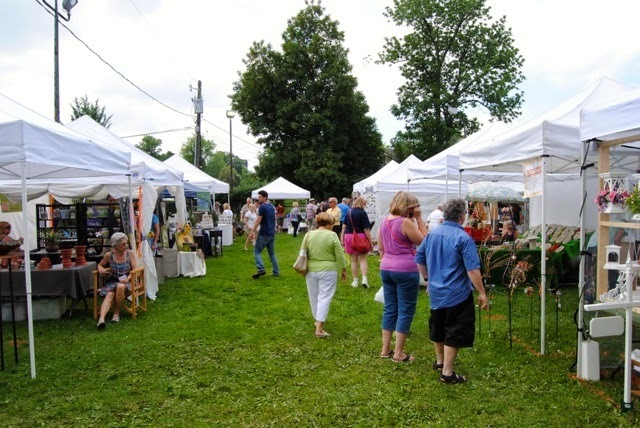 Not all art festivals of this type offer anything close to these "amenities." To promote it, there are currently banners up on the corner of Parkside Avenue and Rt. 198 (Scajaqueda Highway); Press releases have been sent out; it's been in the Buffalo News' coverage of all the summer's gardening events; organizer Mike Shadrack will be on WKBW's noon news weather forecast today, and a brief mention on their Friday morning show; posters are distributed; we're hoping for a Buffalo Rising online article shortly; TV gardening expert Sally Cunningham has mentioned it on her Sunday morning WIVB gardening segment; and we've been pounding it hard on social media (eNewsletters and Facebook). Last year we kept count of visitors with a clicker counter. Including dogs and babies, we hit 1,500 visitors! Here's hoping the weather is good (so far we're looking at 84º and thunder storms), and we break that record. 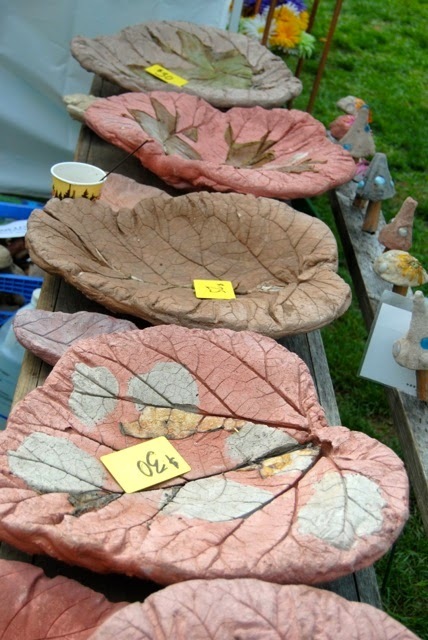 not to sell plants (that's not what the event is about) and they cannot sell mass-produced art and crafts.